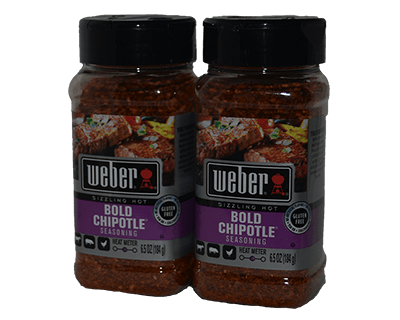 Weber's Bold Chipotle Seasoning mixes the traditional smokey flavor of Chipotle chiles with bold spices. Use Weber's Bold Chipotle Seasoning to spice up you barbecued chicken and pork meals. No MSG. No Artificial Flavors. No Artifical Preservatives. Gluten Free. Combine Weber Bold Chipotle Seasoning, Water and Oil in a ziploc bag and blend well. Add Chicken or Steak and vegetables to bag and gently toss to completely coat chicken and vegetables. Marinade at least 15 minutes turning occasionally. Remove chicken or steak and vegetables from bag and put on a plate. Place kabobs on grill medium direct heat. Turn kabobs to cook on all sides approximately 10 - 15 minutes. Thoroughly cook chicken to 165 degrees. Cook steak to desired doneness. Remove kabobs and enjoy with rice.